If it sounds like the United States is divided and on the verge of some really nasty times, what must it be in Brazil? In early September, Presidential candidate Jair Messias Bolsonaro was stabbed in plain sight at a campaign rally, the attack caught on video and widely circulated worldwide. It was an ugly reminder of the direction being taken in far too many places. Called Mito by supporters, the former Army Captain prophetically tweeted in November 2016 that Brazil in 2018 would follow Donald Trump’s populist example. The first round of Presidential voting held earlier this month proved him right. Bolsonaro fell just short of the required 50% majority, but now he faces only Fernando Haddad of the Worker’s Party in the runoff. Polls show Mito coasting easily to victory. Some are claiming that the swing of electoral fortunes in favor of the Social Liberal Party since the Bolsonaro’s near assassination explains the favorable shift in Brazil’s currency. The real had plummeted to less than 4.20 to the dollar by September 13, a low point posted around the same time as Mito picked up sympathetic support that may have put him over the top. By September 28, though, the exchange value was still 4.05. The real’s somewhat surprising turnaround really took place during the first week in October, in the days leading up to the first round of voting. Was that increasing confidence for Bolsonaro’s victory? If not, maybe BRL’s rebound was tied to the political activities of one of Brazil’s neighbors. Next door in Argentina, that country’s currency, the peso (ARS), had fallen into an even steeper decline. The Argentine President, Mauricio Macri, had asked for an IMF rescue in May, receiving the largest in the organization’s history in early June. But, despite being disbursed the first huge tranche of funding, it would not halt the crash in ARS. 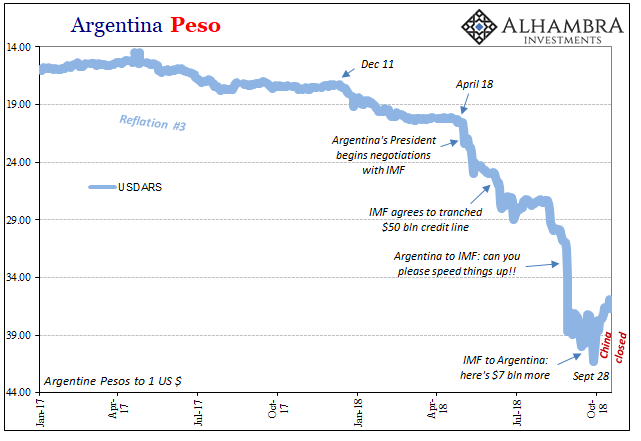 As it performed a dangerous freefall at the end of August, Macri would appeal again to the IMF desperately pleading for the second tranche to be moved way up. 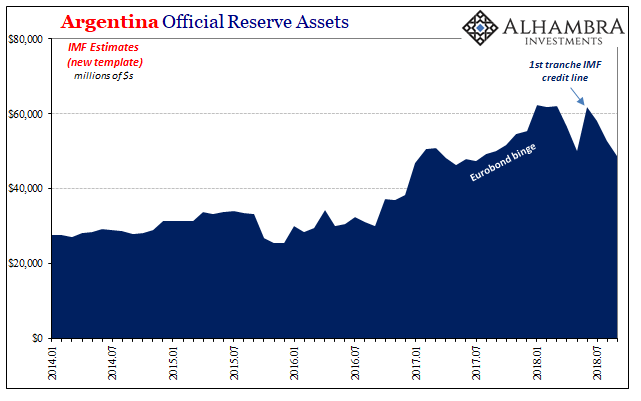 Small wonder, Argentina had effective wasted ~$25 billion in its reserves through September, using up all of that first rescue piece as well as more than $10 billion of its own stockpile. For their trouble, by the end of September, ARS had plunged below 40 to the dollar anyway. It was a stunning reversal for a country that even in early 2018 was still a global darling, the worldwide press writing countless screeds extolling Macri’s successful turnaround for the once pariah state. Instead, the IMF toward the end of September would agree to an additional $7 billion above the $50 billion already committed. 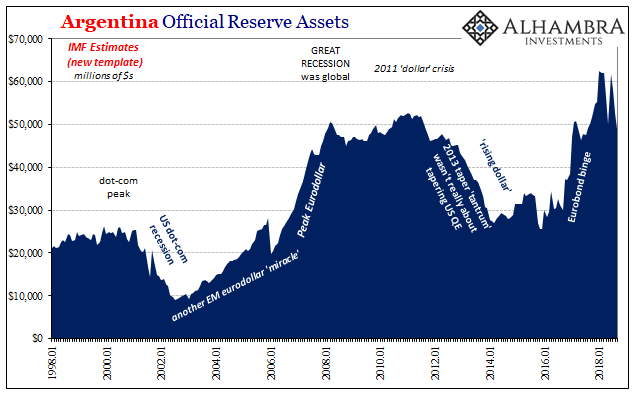 It would only ask for one major concession, that the Argentine central bank refrain from using any of these funds for currency interventions above 44 to the dollar. Since the last trading day in September, this first week in October, ARS had rebounded alongside BRL.  Investors viewing the politics of both nations as swinging in their favor? Perhaps, but there was, and is, something else to consider, another factor perhaps a little more directly related to these sorts of conditions in that crucial first week in October. 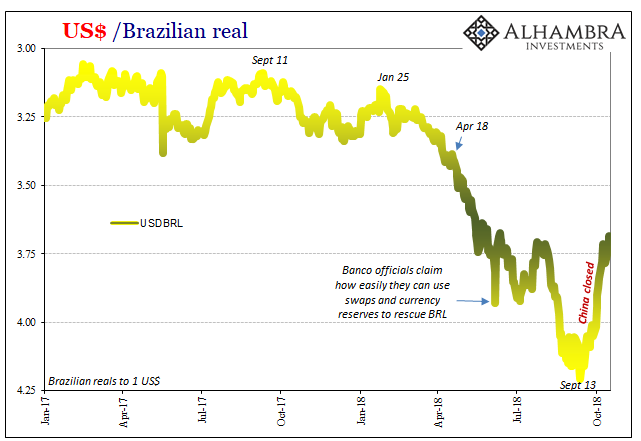 Without the Chinese giant to drag down the rest of the eurodollar system with it, maybe Argentina and Brazil could breathe a little without the pressure being applied everywhere. 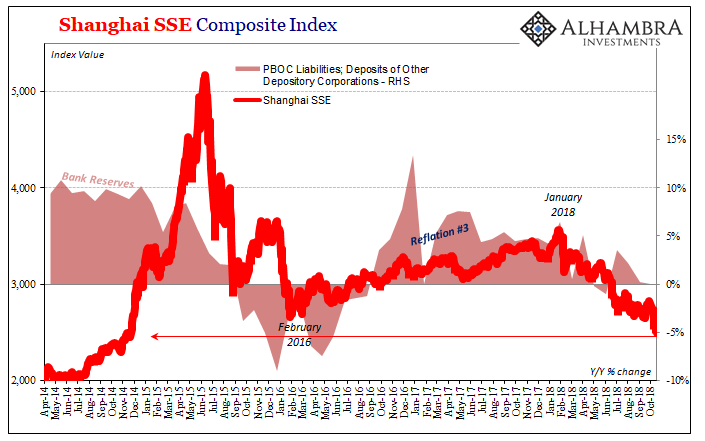 The SSE index is off 30% since January 24, a remarkable shift from a seemingly unbreakable multi-year upward trend that follows the PBOC’s shifting policy toward bank reserves and currency restrictions forced on it by the latest eurodollar squeeze. As noted yesterday, the last RRR cut effective on Monday hasn’t shown up anywhere, certainly not in the stock market. The Chinese currency, CNY, fell today to its lowest exchange rate since the end of 2016 – a time when Chinese officials had panicked about potentially breaching 7 to the dollar. That possibility is now well within reach. To be back again in the same position after all that had happened over the last two years, particularly that whole globally synchronized growth thing, is well beyond disheartening. It is dangerous. 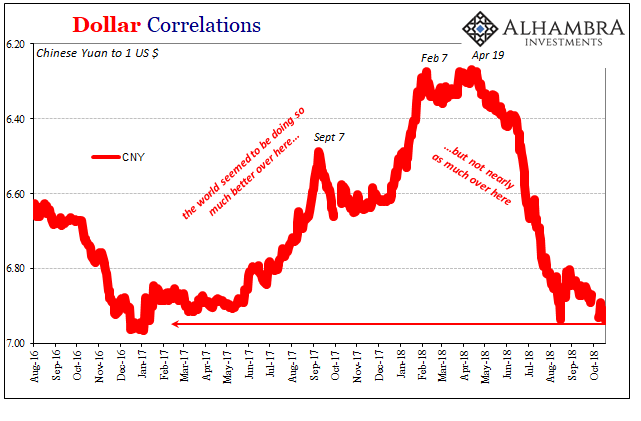 These are not good signs for China, to be sure, but they also tell of further pressures perhaps still building inside the eurodollar system even though it has wrought so much wreckage already. I don’t think it would do any good if instead of appealing to the IMF, President Macri along with future (in all likelihood) President Mito plead with China to go on extended holiday for the rest of the year if not longer. Maybe repeating FDR’s 1933 unusually protracted bank holiday could stop the run because the IMF won’t be able to. And Jay Powell is, well, distracted by having to explain many things which he cannot and never will. That’s what this increasingly looks like, a eurodollar run. Or, to be accurate, another eurodollar run.